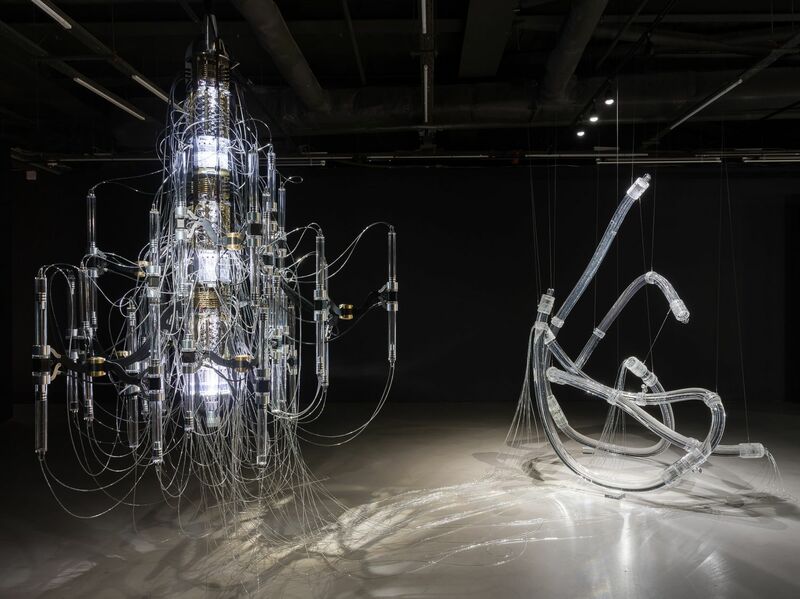 Installation view of Yunchul Kim, Dawns, Mine, Crystal (2018), KCCUK. Photo: Mark Blower. Broken Symmetries, brings together artists who aim to understand and question the physical world by navigating the shifting realities of modern science. Our senses are only capable of accessing a tiny part of our existence. The underlying nature of the universe, including unthinkably small actions which dictate the ways in which our world works, remains ever-elusive. Thanks to the technological and scientific breakthroughs of the last hundred years we are now more able than ever to understand the nature of this hidden realm, revealing and interpreting the symmetries which govern our existence. Nowhere is this more clearly seen than within fundamental physics: the study of basic properties, materials, and forces in our universe. In recent years, CERN –the largest particle physics laboratory in the world– has fostered novel models of creating dialogue and cooperation between arts and science in the physical space of the lab. These encounters enrich and diversify scientific thinking whilst simultaneously providing endless material for artistic inquiry. This approach to collaboration not only impacts and reinterprets the work of both scientists and artists, but also refocuses the importance of cross-disciplinary exploration: illustrating the necessity of different perspectives and approaches in the creation of coherent understanding. Looking at the reality of such encounters, new exhibition, Broken Symmetries is the latest outcome of the Collide International Residency award: one of the core programmes of Arts at CERN since 2011 and a collaboration with FACT, Liverpool for the last three years. The exhibition brings together ten new commissions by international artists who creatively explore the complex notions of current fundamental scientific research: both its findings and processes. Broken Symmetries encompasses a wide-range of artistic approaches: reflecting the diverse ways in which scientists and artists are collaborating (or inspiring one another) in both tackling and communicating some of the most elaborate concepts of modern physics and in doing so, provoking new and significant dialogues within wider society. These new works explore ideas and stories traced to the fundamental and philosophical foundations of science, reflecting the current state of discussions around observation and understanding. Broken Symmetries is curated by Mónica Bello and José-Carlos Mariátegui, and is co-produced by the ScANNER Network, consisting of: FACT (Liverpool), CCCB (Barcelona), Le Lieu Unique (Nantes), iMAL (Brussels) and Arts at CERN (Geneva). Premiering in the UK, the exhibition will then travel to the partner organisations in Spain, France and Belgium until 2020.